Valentine's Day is right around the corner and while some love the more sweet and sentimental gifts, others prefer something more practical. And what's more practical than technology that you would actually use everyday? 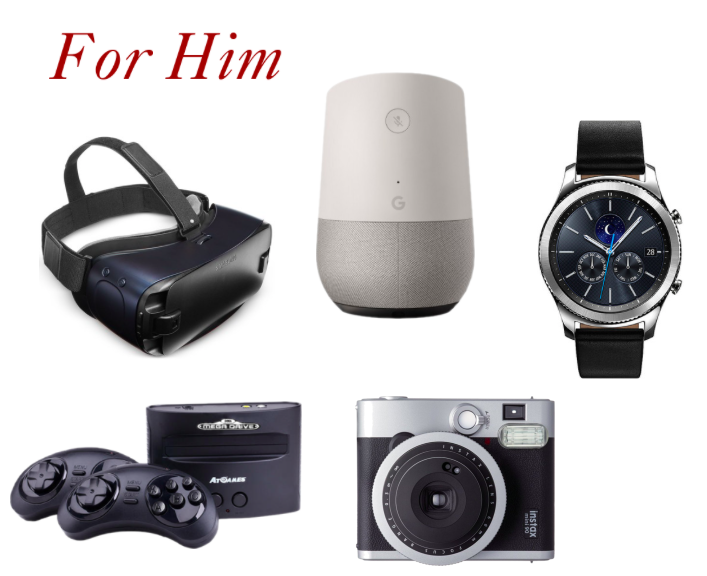 That's why I thought this would be the perfect time to share my favorite tech gifts that's perfect for your significant other. Instax Mini 90 Neo Classic Instant Film Camera - For the photographer in your life, this is the perfect camera since it's so compact, has different settings including zoom, flash, and a self-timer option. Samsung Virtual Reality Headset - I swear, all we ever talk about in my Media Management classes is virtual reality and pretty much every guy I know is interested in owning a headset. This one's budget-friendly and I've heard that it's lightweight compared to other headsets. Samsung Gear S3 Watch - While I love the Apple Watch, the Samsung Gear is a more sleek option for a guy that's constantly at the office or likes to put a little more effort into what he wears. SEGA Genesis Wireless Game Console - For the guys that miss the days of old school video games then this is a great gift and comes with 80 preloaded games. Google Home - For the guy who always needs the newest tech gear, Google Home which is a voice-activated assistant, is probably one of the most exciting tech gifts to give to your loved one. Everyone could use an assistant right? Beats Wireless Headphones - There's nothing more stylish than Beats headphones and I love the new rose gold ones (or if you're looking to get these for your man then they would be called "Bro's Gold" haha). Plus they're super comfortable to take with you to the gym since they're wireless! Michael Kors Smartwatch - Obsessed with the smartwatches that Michael Kors released which is easy to use and looks nothing like a regular smartwatch. 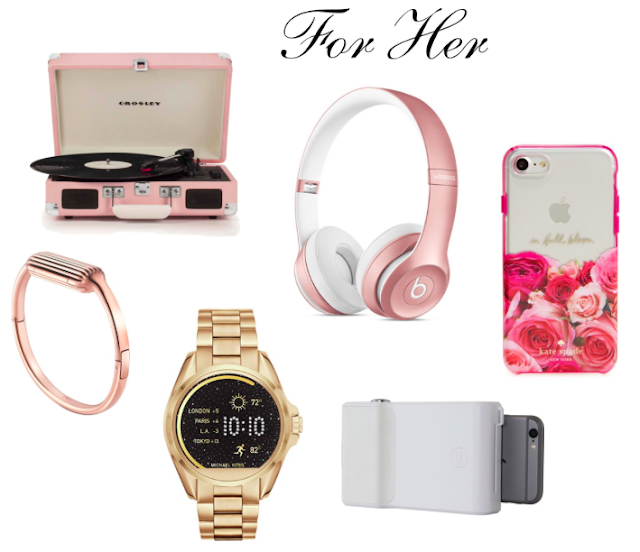 Perfect for a fashionista or a watch-lover. Crosley Record Player - If you're an old soul like me, then the iconic Crosley record players from Urban Outfitters is right up your alley. I'm a big fan of the blush pink color but they come in many different patterns. Prynt Smartphone Photo Printer - I love this photo printer that easily fits into your purse and prints photo straight from your smartphone in seconds. Perfect to capture some memories on Valentine's Day! Rose Gold Fitbit Bangle Bracelet - Everyone that I know owns a Fitbit but I'm just not a big fan of the regular designs but this bangle bracelet caught my eye. The design is so sleek and is perfect to layer with other bracelets. Kate Spade Roses iPhone Case - Every year Kate Spade comes out with a beautiful collection for Valentine's Day and this case was a part of it this year. I love the "In Full Bloom" writing and it's perfect for a girly-girl!